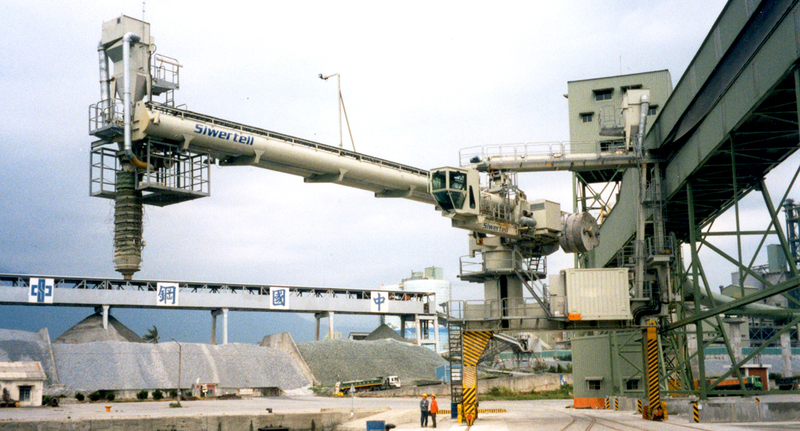 In order for Taiwan Cement Corporation to fullfil environmental regulations as well as increasing operation capacity at their cement export terminal in Hualien Port, located on the east coast of Taiwan, they placed this order with Siwertell for a ship loader. Focusing on a high capacity and environment-friendly operation, the STL 700 unit, which is rail-mounted, is based on Siwertell screw technology. The design of the loader in Hualien is tailor-made to match the customer’s fleet of selfunloading vessels. Included in the supply is a movable belt tripper arrangement connected to the loader. From the belt tripper the cement is fed into the feeding screw conveyor of the loader, taking the material to the slewing centre of the unit. By gravity, the cement falls into the horizontal loading screw conveyor. It is further conveyed into the loading bellows at the outer end of the conveyor for distribution in the ship’s transferring system.